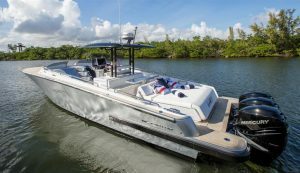 The 42’ Canados Gladiator is the ultimate day-cruiser : Atlantic Yacht & Ship, Inc. The 42’ Canados Gladiator is sleek and stylish, making the ultimate day-cruiser. As the sun shines on the silver hull, you can’t help but turn and look at this new 2018 boat! Triple Mercury Verados power the Gladiator. Additionally, she has powerful bow thrusters and joystick control, making maneuverability and docking a breeze. A garage for Seabobs is hidden underneath large aft walk-around sun pads. The aft lounge makes a comfortable social area for friends and family. A well thought out space for beverages is conveniently located behind the aft lounge. This area has a removable sunshade available for use at anchor. Equally important, a stainless steel carbon fiber removable and foldable shower pole allows for quick access to hot and cold water on the swim platform. Positioned on each side of the helm area are lounge-sofas. This allows the captain to enjoy company while navigating. The entrance to the cabin and head is located between the lounge-sofas. Uniquely, the head of the Gladiator is strategically designed for look and space. This is a must see! Not to mention, a Factory 2 year Warranty on the Hull and a 3 year Engine Warranty! Contact Stephen Faraldo today at Atlantic Yacht & Ship, Inc. for more information on the new 42’ Canados Gladiator 2018. From Italy to Florida, the 42′ Canados Yachts 2018 begins her journey!